There are no icons to display. Click here for this week’s newsletter dated, 18th April 2019. Click here for this week’s newsletter dated, 12th April 2019. Click here for this week’s newsletter dated, 05th April 2019. Click here for this week’s newsletter dated, 29th March 2019. Click here for this week’s newsletter dated, 22nd March 2019. Click here for this week’s newsletter dated, 15th March 2019. Click here for this week’s newsletter dated, 08th March 2019. 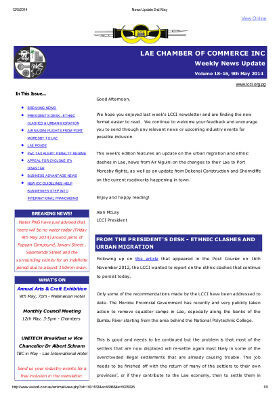 Click here for this week’s newsletter dated, 01st March 2019. Click here for this week’s newsletter dated, 22nd February 2019. Click here for this week’s newsletter dated, 15th February 2019.